She faces two years in prison if charged and convicted. In the video, the woman can be seen constantly yelling at the officer, waving the steering lock in her hand in order to intimidate the officer. 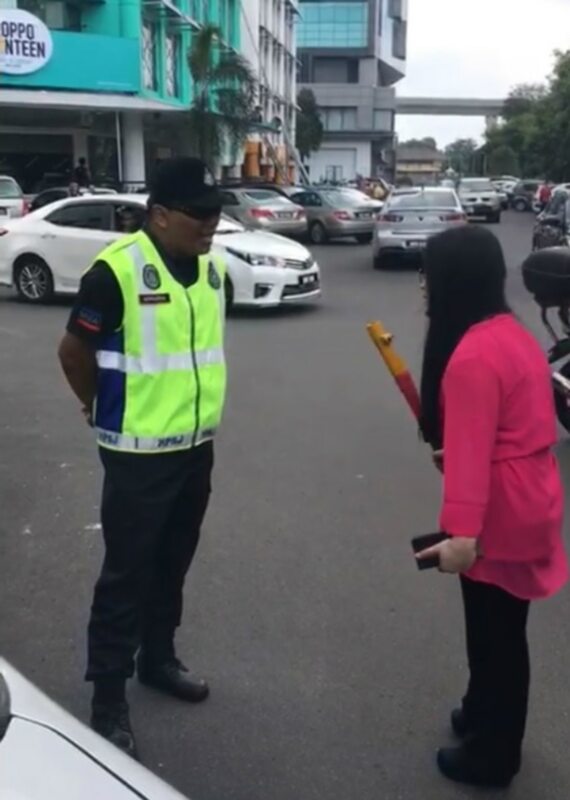 However, the MPSJ officer, who did not lose his temper, continued to remain calm throughout the situation, trying to reason with the woman. The incident was reported to have happened in Bandar Puteri Puchong at 1pm. 2. The woman claimed that she was buying a meal for her disabled husband. "Is that wrong? Apa salah saya (what is my offence)", she can be heard yelling in the video. To which the officer explained to her that while it's not wrong to buy a meal, she had indiscriminately parked her car. "It's not wrong to buy a meal. But, you parked at the wrong spot," he said. To which the woman retorted saying that she had nowhere else to park and that she had bought her food quickly, so why did he clamp her car. While the woman's car had the OKU (disabled) sticker, the woman admitted that it was her husband who is disabled. However, he was not around at the time of the incident. The woman continued to yell at the officer, saying, "We must understand that the OKU do not have time, and I am helping the OKU, don’t you understand?" 4. Her car was eventually towed to an MPSJ depot in Puchong and at 2.45pm her husband went to the depot and paid the fine. He also apologised for his wife's behaviour. MPSJ deputy president Mohd Zulkurnain Che Ali was quoted by The Malay Mail, saying that his men were forced to call for additional help from the police and the husband of the woman as she refused to budge after the council officers called a tow truck. She only exited the car after her husband showed up and persuaded her. He paid RM190 for the compound fine and towing costs. According to a report in NST Online, Serdang district police chief assistant Commissioner Megat Mohd Aminuddin Megat Alias said that the MPSJ officer had lodged a police report at about 7pm yesterday. Note: Initial reports by NST Online mentioned that the woman had parked her car at a spot reserved for the disabled. While NST Online is still reporting that the woman had parked her car wrongly at a spot for the disabled, a report in The Star Online said that she had parked in a wrong spot. The 31-year-old said that he gets scolded and verbally abused every day. A student's viral complaint about being kicked out for "studying" has opened a whole new can of worms. The girl was 13 when he started sodomising her.